Welcome by the RailTraction online Readme of the add-on Sdggmrss. The Sdggmrss is a sixaxle freightwagon for the transport of trailers. The new multi-function wagon has a 2"700 mm-wide pocket for transporting these trailers. The more generous dimensions and open construction of the lower area of the wagon accomodates megatrailers without the necessity to reposition any major components. The wagon has a new height-adjustable cradle for even greater loading and unloading efficiency. It can also be used for standard trailers: its sliding beam enables it easily to be converted by a single operator for use with containers and swap bodies of all types and dimensions. This add-on contains the European freightwagon Sdggmrss. Included are 11 different skins. 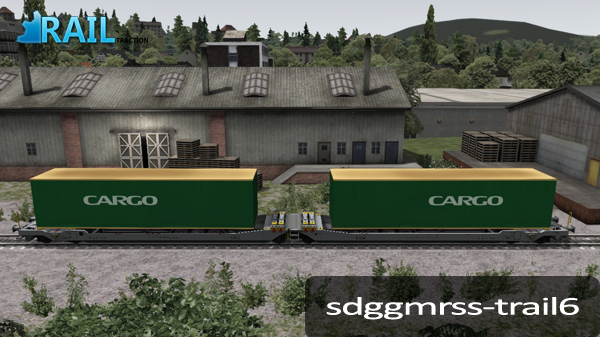 The add-on Sdggmrss contains one Free Roam scenario for the Seebergbahn and is named "Trailer wagons - free drive". Please note: You will need to have had Train Simulator 2012 in order to play this scenario. This tab informs you about the procedure to place the Sdggmrss in your own scenario. Please follow the next instructions. Now you will find the freightwagons in the tab trains named "Sdggmrss". You can and you are allowed to make reskins of the freightwagon. A special reskin kit is included to make reskinning easier.